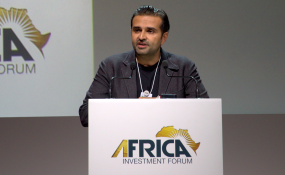 Ashish Thakkar presents the Mara Phone to Africa Investment Forum in Johannesburg. Pan — African multi-sector business services company Mara Corporation has set its eyes on the South of Africa, as it looks to invest multimillions in the economy of South Africa. The Rwanda-based firm will introduce affordable, hi-tech smartphones in the country, expanding its reach and fulfilling the demand of the market. The new project aims at enhancing communication. According to Ashish J. Thakkar, the founder of Mara Group and Mara Foundation, there are over 400 million smartphones in use in the continent of Africa, with the number likely to reach a billion. Technology and innovation and digital migration have posed business investment opportunities for tech firms more so in Africa, with the continent's population offering a market for their products and services. Many businesses are embracing the use of technology to make work easier and operations cheaper, forming a pool of investment for mobile firms. A total of 22.4 million smartphones were shipped in Africa during the second quarter of this year (Q2 2018), according to the latest report from International Data Corporation (IDC). South Africa, the second biggest mobile phone markets after West African country Nigeria posted a YoY growth of 25 percent. South Africa remains the continent's most developed telecommunications market, with smartphone shipments up 17.4 percent YoY in Q2 2018 to total 3.4 million units. The Dubai-based British entrepreneur seeks to compete in the market by introducing smartphones made in Africa, for Africa. Traders use a substantial amount of money to ship in such products, but the new Mara project should ease the cost of their operations. "Mara is extremely excited to be investing $100 million in South Africa in the first high tech high-quality affordable smartphones in South Africa," commented the CEO. President Cyril Ramaphosa has implored businesses to consider investing in South Africa's economy, as part of the government's plan to resuscitate the economy. According to The Mobile Economy: Sub-Saharan Africa 2017 report, as of March 2017, approximately 270 million people in the Sub-Saharan region were accessing the internet through mobile devices, and the number of registered mobile money accounts reached 280 million.